Tangus is an ISSR (International Shiloh Shepherd Registered) born September 5, 2000. A sweet and gentle companion animal, he is popular for his tail wagging affection. He is a born leader who embraces life and has a natural ability to adapt to almost any situation. Tangus has been described as “a four legged angel who adds joy to the world with his unconditional Love." He understands and often mirrors your emotions. Note however, that he expects to be engaged in play and petted by everyone he meets, from the eldest to the youngest. 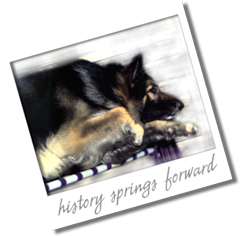 This plush coated Shiloh Shepherd partners with Straja Linder King, Registered Art Therapist, in her workshops and counselling. He works with clients of all ages and situations including palliative, grief, mental and emotional stress, self-esteem and relationship issues. Tangus boasts more certifications than Linder King, and his qualifications are enhanced by his community service visits and volunteer work. According to John Griffith, the director of Spiritual Directions, “Tangus brings another dimension to the caring relationship that is personal, spiritual and non-verbal. He is more than just a pet. There is something beautiful in the way he relates. He is a tangible presence that draws people to him and offers them the gift of acceptance." Now Tangus is a hero too! 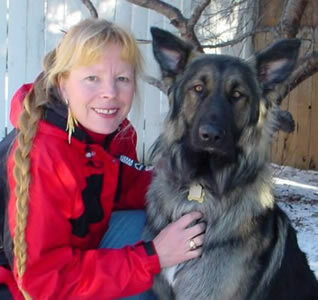 Dr. Madeline Rugh nominated Tangus for his therapeutic touch and heroism in protecting her from two black bears. On Saturday, October 22, 2005 the Pet Society of Northern Alberta hosted it's ninth annual Heroes’ Dinner which recognizes animals in their community for special acts of devotion and caring. Tangus was selected as a recipient of the 2005 Hero Award. Despite all his credentials, Tangus‘ favourite pastime is still pressing his nose against the window and quietly watching the sunset.